…Until my family came to visit this past weekend. Originally, just my parents and little bro were coming over and my sister and her boyfriend were joining and we were all going to the beach and to get seafood and maybe go to the outlets and just hang out. But my mom’s family didn’t have our usual summer get-together this year, so a last minute family BBQ was planned @ our house and my grandma, a couple of my aunts, and 2 of my little cousins joined in. Vin and I went on a shopping spree @ the supermarket for meats to grill and bought packs of hot dogs and buns, salad, corn, ice, soda, beer, water… and we sweeped and vacuumed and cleaned and did yardwork… and then, on Saturday morning, I decided to bake. I rarely get to give baked goods to my own family, let alone see them, so I wanted to make something special. I bought these baking cups that looked like large disposable mouthwash cups, which would have been perfect for sno cone cupcakes. Long story short, I wasn’t used to these baking cups @ all since they took twice as long to bake cupcakes (20 minutes for cupcakes? With THIS oven? Unheard of in this house!) and I was really rushing it with the frosting. I used leftover frosting from C+H’s wedding and it wasn’t thick enough to hold the scooped ball shape, and it just looked sloppy. I’m determined to try this again and put in more effort next time. 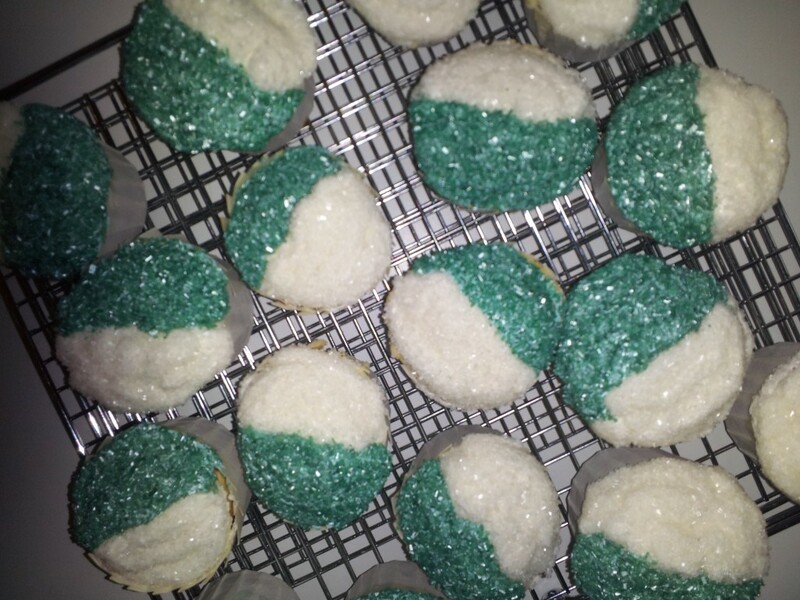 “Sno cone” orange and vanilla cupcakes with lime and vanilla frosting… and SPRINKLES! 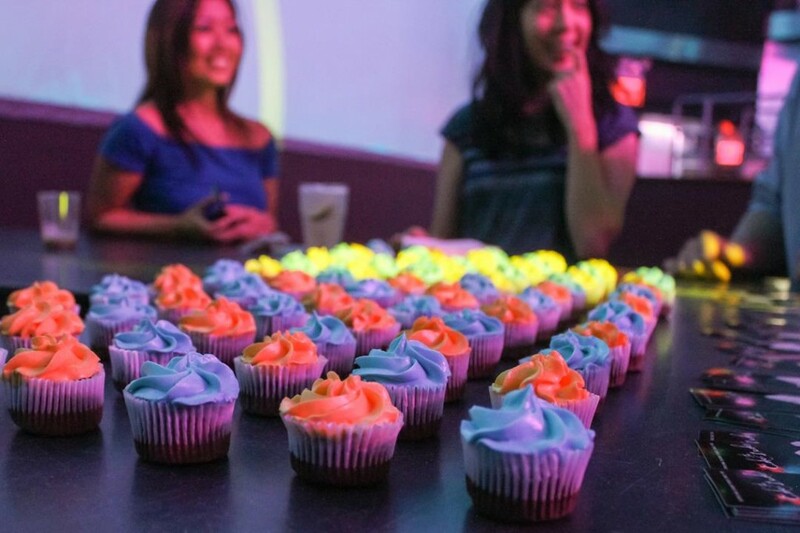 After work, I brought the cupcakes to the lounge and D and her friends helped me set them up on the bar and we spread out a bunch of my biz cards. 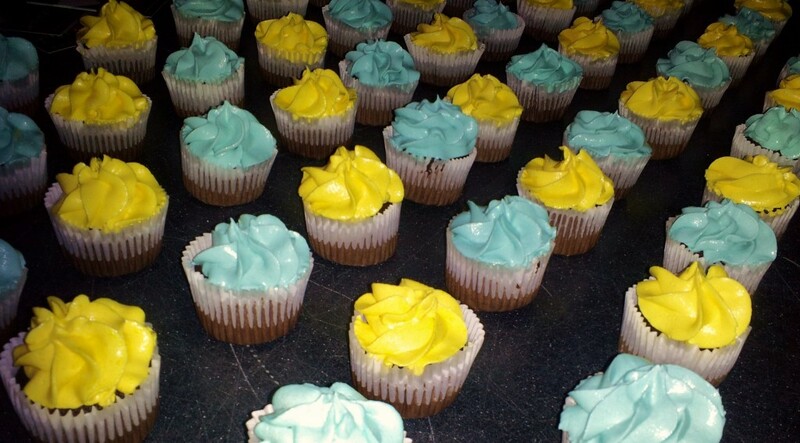 Once all the minis were laid out, 72 cupcakes didn’t look like much. 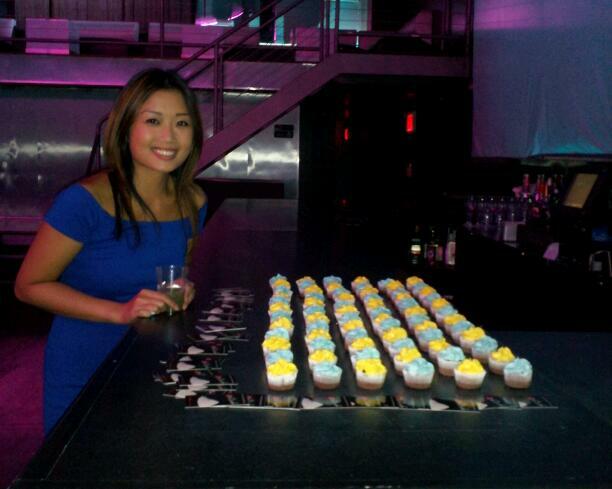 haha People came in and saw the cupcakes, but seemed to think they weren’t real or too nicely displayed to eat. I mean, it DID look pretty awesome. The lighting was really neat; the light blue and yellow frosting appeared dark blue and pink as the colored lights flashed by. Once we messed up the arrangement and scattered the minis, people started digging in. I couldn’t stay long and had to catch the train, but I heard that soon after I left, the cupcakes went quickly… one guy apparently nabbed 3 @ once! Tune in next time for a bouquet of baked goods and bonbons for a beautiful bridal shower!